To determine the focus, scope, and developments over time of Gulf investments in the Horn of Africa, this report maps the extent of these investments. This mapping is derived from Clingendael’s database on commercial investments by entities connected to Gulf countries (Saudi Arabia, the UAE, Kuwait, Qatar) in the Horn of Africa (Ethiopia, Sudan, South Sudan, Somalia, Djibouti, and Somaliland). The investments include foreign direct investments and foreign portfolio investments, and involve Gulf entities buying assets of or setting up business interests in the Horn of Africa (both greenfield and brownfield, including affiliates, fully owned subsidiaries and joint ventures). The database is an overview of commercial investments and therefore does not include religious funding, macroeconomic credit, payments to individuals in the Horn, payments for peace processes or similar activities. Official development assistance by Gulf development funds is covered in section 4.5. The database contains 434 investments from 2000 to 2017 in 16 distinct sectors, worth approximately USD 13 billion. The data includes dates, locations, sectors, investment amount, investment type, investment partners and employment creation. Not all entries could be completed in full detail due to differing data quality across sources. Because not all investment values were traceable for each transaction, the analysis tends to focus on the number of projects rather than the figure invested (see also box 3). For countrywide projects and those for which the specific location data is not available, the project has been coded as taking place in the capital city when represented visually. Similarly, for regional projects the centre of the region was coded. 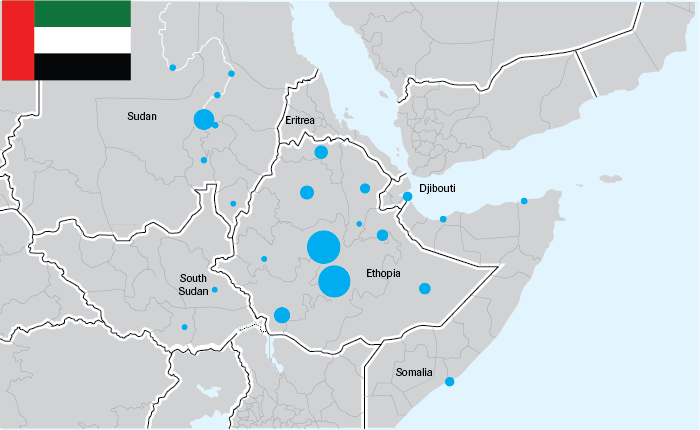 The data for Ethiopia is of a higher quality than the other Horn of Africa countries. Consequently, some parts of the analysis will examine only Ethiopia, and overviews of the entire Horn may overrepresent Ethiopia. Nonetheless, the data manages to capture important patterns and trends of Gulf investment in the entire Horn region. The data originates from both public and private databases, news articles and companies’ annual reports, as well as by private connections with investment agencies of individual countries. The figures in this dataset should be seen as an indication of overall investment patterns by Gulf actors in the Horn rather than a definitive and complete overview (see box 3). Quantifying the volume, economic and geographic scope of recent investments is a necessary step to assessing the significance and consequences of Gulf involvement in the Horn. Quantifying and assessing the relative importance, the size and operations of different investments and the financing streams are notoriously difficult however. Elite politics around the world is almost always hard to penetrate, especially to the extent it includes particularistic and clientelistic arrangements deliberately kept opaque. The foreign and economic policies of Gulf states are particularly opaque, however, as even general budgets are seldom published and contracts almost never disclosed or debated (whether in parliament or the press). Additionally, the results of investment projects are seldom systematically assessed, let alone published. Efforts are further compounded by the generally poor quality of statistical data in the Horn due to underdeveloped measurement and reporting standards. On top of that, several Horn states that do produce data have been known to amend the official data specifically to show consistent growth and development. Analysts therefore often have to work with low quality data and second-best guestimates, and reason through inference based on interviews, rumours and imprecise judgements. As a consequence, data presented in this section ought to be read as indications of political interest or economic activity in the designated regions and sectors, rather than as hard numbers. Closer inspection of investment projects is likely to demonstrate funding that remains unaccounted for, mismatches between different accounting systems, lacking or unrealistically high reported production and a variety of other issues. Nonetheless, attempts have been made to keep the data presented here as reliable as possible (for an overview of the methodology, see annex 1). The 1990s saw a politically tumultuous period in the Horn of Africa combine with a low oil price of USD 20 to USD 40 a barrel. The start of this decade witnessed the Derg regime fall in Ethiopia and Siad Barre’s regime collapse into civil war in Somalia; the end of it saw Ethiopia and Eritrea fight a two-year war.‍ During this period investment was scant from the Gulf states, which had neither the cash on hand nor the risk appetite for commercial investments in such fragile states. By 2000, the oil price had begun picking up; unsurprisingly so did Gulf investments, especially in the wake of the end of overt Eritrean-Ethiopian hostilities and a peace agreement in Sudan (2005). 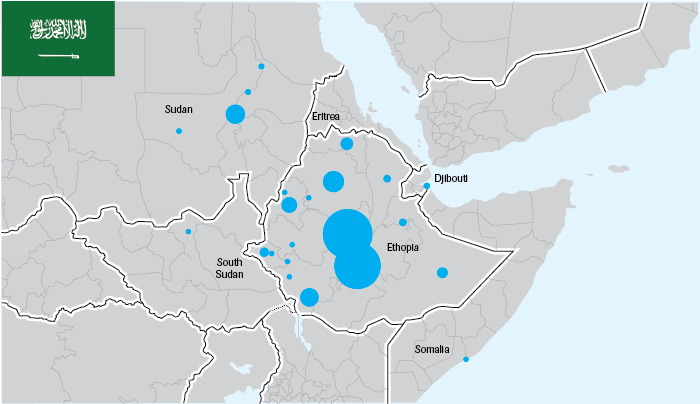 For example, in the 1990s there were only 35 Gulf investments in Ethiopia, relative to 365 since 2000. Figure 7 shows the correlation between the Brent Crude oil price and Gulf investments in the Horn of Africa from 2000 to 2017. The annual number of investments rose from fewer than 10 in 2000 to more than 50 in 2012 for the entire Horn of Africa, roughly following the oil price during that time. Both the oil price and the number of investments peaked from 2008 to 2014, and have fallen since then. Investments in Ethiopia more than halved between 2016 and 2017, which could be explained by the protests in the Oromia region in late 2015. In 2016 Gulf investments in Oromia declined slightly. In 2017 they dried up completely. Sudan followed a similar trend. Investments steadily rose there from 2000 to 2008, despite the sanctions from 1997 to 2017. Sudan received 52 investments between 2000 and 2017, the most coming in 2008. Investments after 2008 decreased in the wake of the decline in the price of oil. South Sudan saw six investments spread between 2008 and 2014, and no notable change after its independence in 2011. Somalia saw five investments spread out thinly between 2000 and 2017. Djibouti saw five between 2000 and 2008, mainly from the UAE. One explanation for the end of Gulf investments in Djibouti after 2008 is that relations between Djibouti and the Emirates become strained when the government of Djibouti accused well-known businessman Abourahman Boreh of corruption and took DP World to court over the matter.‍ Since then, Djibouti has gone through ups and downs (including the February 2018 nationalisation of the Doraleh facility) and the government of President Ismail Omar Guelleh has looked to China for many of its key investments, including port expansions. The lack of commercial investment in Eritrea has several possible explanations: there is little of commercial interest; the finance that does enter Eritrea is not commercial and does not go through public channels; and given imposed sanctions and the nature of the Eritrean regime little reporting covers commercial investments in the country. Total spend as well as average spend per project followed a more jagged trend line than that presented in figure 7. Both did show increases from the early 2000s and peaked between 2006 and 2010, when the oil price was at its high point, before declining afterwards. The exception to this trend is a UAE investment in Ethiopian sugar manufacturing worth around USD 3 billion in 2017, the single largest investment made in the period. Overall, around 40 percent of the investments have been worth less than USD 1 million, 36 percent between USD 1 and USD 10 million, 18 percent between USD 10 and USD 100 million, and 6 percent more than USD 100 million. Figure 8 presents a breakdown of the individual investor states and recipient states. Two patterns are immediately visible. Firstly, Saudi and Emirati actors have made the most investments. 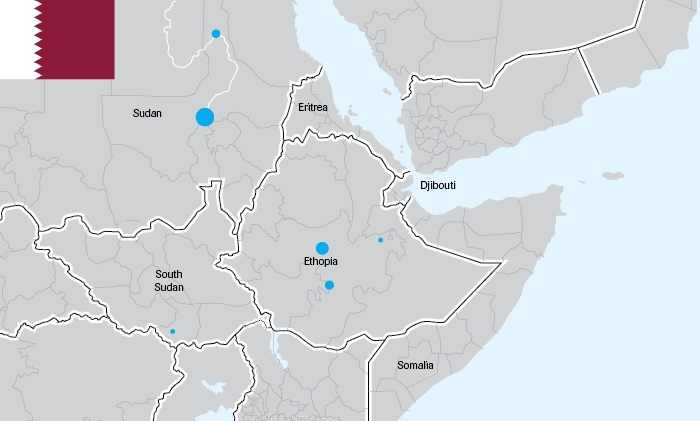 Secondly, Ethiopia and Sudan have received the most.‍ Clearly, investments from the UAE and Saudi Arabia into Ethiopia and Sudan make up a large portion of the total by Gulf countries in the Horn of Africa. However, this does not take into account the size of the investments. Several sizeable investments have been made into Djibouti and Somalia; Kuwait has also made large single investments. Somaliland is included in Somalia. Figure 8 presents the number of investments from 2000 to 2017 in the Horn of Africa by each of the four Gulf states. Several important geographic patterns are noticeable. Firstly, Ethiopia and Sudan received the most investments. Although this pattern may to some extent reflect Sudan’s historical and religious ties to the Gulf (see section 3), the focus of investments on both Ethiopia and Sudan also reflects the relative importance of these two states to politics in the wider Horn, increasing these states’ leverage. Around one-third of the investments in Ethiopia were in Addis Ababa (mainly manufacturing and a range of services), another third in the Oromia region and the final third was spread throughout the rest of the country (both mainly agriculture and manufacturing). The investments in Sudan tend to focus on Khartoum (especially banking and telecommunications) and agricultural investments along the Nile. South Sudan has received several investments, mainly in Juba (banking, telecom, and construction), and agricultural investments outside of the capital. A limited number of investments have been made in Djibouti, Somaliland, and Somalia; all are located along the coast. Large investments have been made in the ports of Djibouti, Berbera, and Bossaso. Additionally, Djibouti City and Mogadishu have received several small investments in services such as trading and logistics. Investments in Somalia and South Sudan may be reduced, as investing in fixed assets has been a difficult undertaking at best given instability there, and the bargaining power of its political elites may have been undermined given the fragmentation of the political settlement. 434 investments, approximately USD 13 billion. 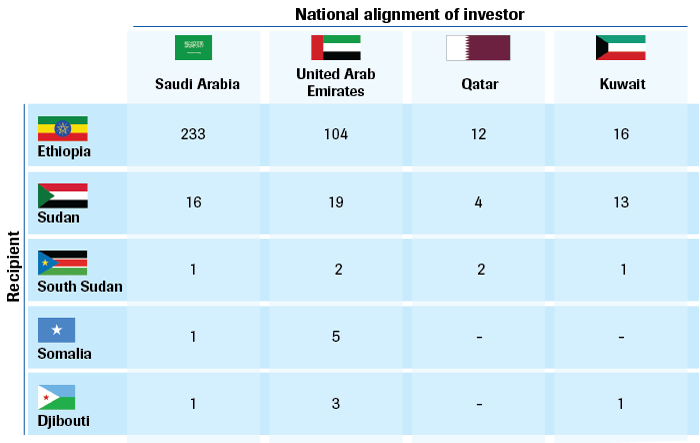 To disaggregate the figure 9 map, those that follow show only a single Gulf investor in order to highlight which countries and regions they invest in, and whether there are any significant differences (see figures 10–13). 252 investments, approximately USD 4.9 billion. 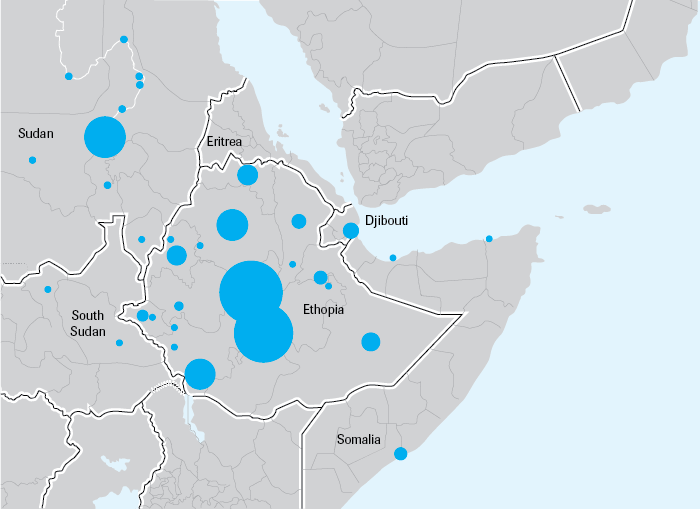 Most Saudi investments have been in Ethiopia, followed by Sudan. Investments in Ethiopia have primarily been in agriculture and manufacturing; investments in Sudan have focussed on agriculture. Only several small investments have been made in South Sudan (agriculture), Djibouti (trading), and Somalia (trading). The 233 investments by Saudi actors in Ethiopia are spread throughout the country, the majority in Addis Ababa and Oromia. By far the most prominent Saudi investor in Ethiopia is Sheikh Mohammed Al-Amoudi (see box 4). Through his company MIDROC (Mohammed International Development Research and Organization Companies), he has invested in a diverse range of sectors, including agriculture, manufacturing, mining and real estate. He has been a pioneer in investing in Ethiopia, often paving the way for others to follow. Interviews from Ethiopia suggest that a large proportion of land bought by Saudi Arabia in Sudan and Ethiopia for agricultural purposes is left undeveloped and does not reach the operational stage.‍ The total value of the investments for Saudi Arabia in the Horn of Africa is around USD 4.9 billion. As a side note, one of Saudi Arabia’s political interests in the region is isolating its rival Iran and denying Iranian access. Although the rivalry is fought out in many domains, in terms of investments in the region Saudi Arabia dwarfs Iran. For a comparison, from 2000 to 2017 Iran made 22 investments in Ethiopia worth around USD 20 million. This asymmetry is unsurprising, as Saudi Arabia shares the Red Sea and a long history with the Horn of Africa, in addition to having a larger economy and higher oil exports than Iran. It is interesting to note that the focus of Iranian investments in Ethiopia in terms of location and sectors is identical to both Saudi Arabia and the UAE. Around half of Iranian investments were in manufacturing, followed by agriculture. 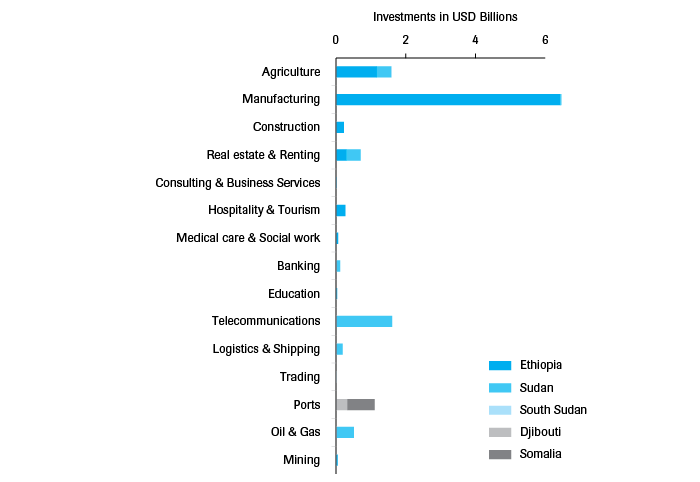 Oromia was the largest recipient of the investments, followed by Addis Ababa. 133 investments, approximately USD 5.1 billion. Emirati actors have are responsible for the second most investments in the Horn. Their investments have primarily gone to Ethiopia and Sudan, but it has also had four other large port investments: two in Djibouti city along with very large recent deals in Berbera (reportedly worth USD 442 million) in 2016 and Bosaso (reportedly USD 336 million) in 2017. Those are the only Gulf investments in Berbera and Bosaso. Because of their size, the UAE is the largest Gulf provider of FDI in Somalia and Somaliland. These investments were made by DP World, a company formed in 2005 when Dubai Ports Authority and Dubai Ports International merged. It is frequently perceived as a foreign policy tool by the UAE state that acts in tandem with the UAE’s security apparatus: for example, immediately following the DP World and Somaliland government deal for the management of Berbera port in 2016, the UAE was granted rights by the Somaliland government to set up a military base in the region.‍ DP World and the UAE now face stiff competition in the logistics sector in the region from Chinese firms, who have supplanted the UAE in Djibouti and are heavily engaged in the Horn of Africa with their Belt and Road initiative. Although DP World is not (officially) active in Eritrea, the UAE has established a military base in the port of Assab. Like Saudi Arabia’s, Emirati investments in Ethiopia are widespread, with Addis Ababa and Oromia again hosting the most projects. The single largest Gulf investment in the Horn is a UAE capital outlay in the Somali region of Ethiopia in 2017 for the manufacturing of a sugar plantation, worth around USD 3 billion. This is noteworthy because the UAE is one of the primary destinations for Somalia’s illegal charcoal export, in which ships carrying charcoal travel from Kismayo in Somalia to the Gulf, and return with sugar that is smuggled over the Kenyan border into the Common Market for Eastern and Southern Africa, a free trade area that includes Ethiopia.‍ Emiratis also have made small investments in agriculture and construction in South Sudan. The total value of UAE investments is around USD 5 billion. 31 investments, approximately USD 2.4 billion. Kuwait has significantly fewer total investments than Saudi Arabia and the UAE. However, it has had several large brownfield investments, particularly in Sudan. Acquiring a 5 percent stake in the Sudanese oil company Sudapet Company and all of Sudan Telecommunications Company together account for almost USD 2 billion, around 80 percent of Kuwait’s total investment volume. Around a third of Kuwait’s total number of investments are in agriculture, split between Ethiopia and Sudan, but their value is low. Kuwaiti companies have also made several large investments in banking in Sudan, as well as investments in construction and logistics and shipping in Ethiopia. The brownfield nature of the largest Kuwaiti investments indicate that the country may be less politically driven than the other Gulf states (given that such assets can be subjected to relatively high quality due diligence and valuation) and more focussed on profitability of their investments. Unlike other Gulf states, Kuwaiti investments seem to be primarily in established and profitable enterprises at realistic valuations. The total value of the transactions involving Kuwait is around USD 2.4 billion. 18 investments, approximately USD 0.6 billion. Qatar’s investments over the last 20 years have been reasonably limited. It has a small assortment of investments in Ethiopia, the largest of which is a slaughterhouse in Harari. In Sudan it has a large real estate investments and an agriculture investment through Qatar’s Sovereign Wealth Fund, together worth more than USD 500 million. Qatar National Bank opened a branch in South Sudan in 2011, making it the first foreign bank to open in the new country.‍ Qatar National Bank also owns a substantial stake in Ecobank, which operates in South Sudan as well. Because of its close ties to Eritrea — exemplified by Qatari mediation and peacekeeping troops on the Djibouti-Eritrea border — Qatar has not been as welcome in Ethiopia as other Gulf states even though Eritrea cut its ties with Qatar in June 2017 following the GCC crisis and pressure from the Saudi and Emirati side. The total value of the investments for Qatar is around USD 0.6 billion. The two sectors with the most investments are agriculture and manufacturing, which have seen significantly more investments than all other sectors combined, as shown in figures 14 and 15. Despite numerous agricultural investments in Sudan, manufacturing investments have gone almost exclusively into Ethiopia, though given its higher relative data quality Ethiopia may be overrepresented in the data. Agriculture and manufacturing also have the highest investment value of the various sectors, as shown in figures 16 and 17. As indicated earlier, these two sectors are frequently cited as a strategic asset to the Gulf and Horn. Large tracts of undeveloped fertile land in the Horn of Africa are appealing to food-insecure Gulf states. At the same time, African states, particularly Ethiopia, want to transition from being primarily commodity exporters into economies with significant manufacturing operations. Additionally, the economic viability of developing such agricultural lands is often questionable. Figure 17 also shows that although telecommunications and ports have relatively few investments, several of them have been quite large. For example, the UAE’s DP World’s 2016 Berbera Port deal with the government of Somaliland was worth USD 442 million, and Kuwait’s Mobile Telecommunications Company acquired a 61 percent stake in Sudanese Mobile Telephone in 2006 for USD 1.3 billion. This last deal is particularly interesting as it gives a Kuwaiti company a controlling stake in a Sudanese telecommunications operator, while foreign investors are usually restricted to a 49 percent stake (often with Sudanese governmental agencies maintaining 51 percent), and in some countries telecommunications is a protected industry (such as Ethiopia). 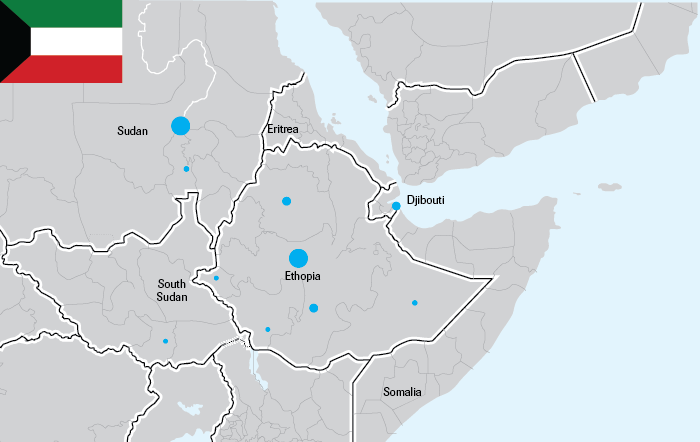 Within Ethiopia, Gulf investments are estimated to have created close to 300,000 jobs between 2000 and 2017, about one-third permanent and two-thirds temporary. More than half are in agriculture and most of the rest in manufacturing. Oromia received almost half of the total jobs, followed by Benishangul-Gumuz and Addis Ababa at around 10 percent each. In both sectors, Saudi-led projects created most of the jobs, followed by those initiated by Emirati actors. The creation of jobs is highly relevant for the developmental ideology of Ethiopia’s ruling party (see section 5). Gulf investments that create jobs are one means by which economic development and poverty reduction are achieved, contributing to the legitimacy of the regime. 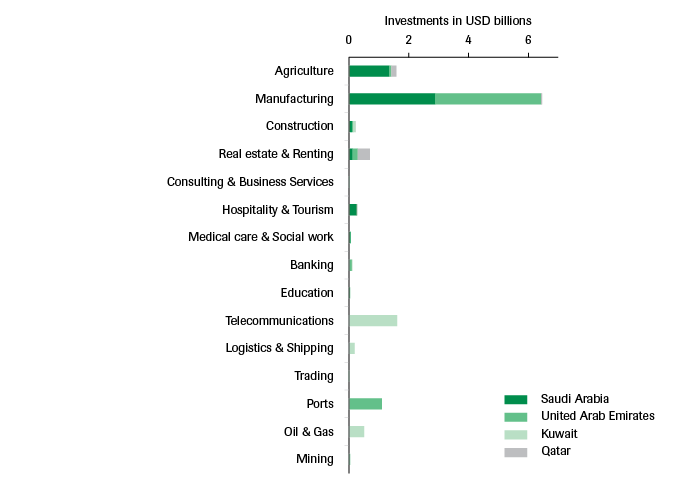 Several noteworthy differences in the ways Gulf countries invest are discernible. This section considers only Ethiopia, as it provides significant detailed information for all investing parties. Slightly more than half of the Gulf investments that have gone into Ethiopia since 2000 have been wholly foreign owned; the rest have been joint ventures with domestic Ethiopian companies. Saudi Arabian companies that invest in Ethiopia have done so alone just under half of the time, and with an Ethiopian company just under half of the time. They have partnered with a range of other foreign investors as well, most often the USA or Sudan. Saudi companies investing in manufacturing are significantly more likely to engage in joint ventures with Ethiopian companies than in agriculture. By far the largest single Gulf investor in Ethiopia is Sheikh Mohammed Hussein Ali Al-Amoudi, a dual citizen of Ethiopia and Saudi Arabia. Although Al-Amoudi is half Ethiopian, his investment vehicles such as the MIDROC Ethiopia Investment Group and Saudi Star are classified as Saudi Arabian and ‘wholly foreign’ given that the origin of the capital is predominantly Saudi Arabian. Mohammed Hussein Al-Amoudi was born in Ethiopia in 1946 to an Ethiopian mother and a Saudi father. He moved to Saudi Arabia in 1963 and built a fortune through his businesses in a range of industries, including construction, agriculture and energy. His success is seen by many as attributable to his connections with the Saudi ruling elite as he was politically selected for several very profitable public contracts. When he first arrived in Saudi Arabia, he became the driver of Ali bin Moussalem, who was at that time very close to the Saudi minister of defence. Through this network, he came into contact with investors and likely became the Saudi sponsor of a large Swedish construction company.‍ In his business ventures he has represented Saudi investors across the world, and is the public face of Saudi investors in Ethiopia. Al-Amoudi is currently estimated to be worth around USD 10 billion, is the richest Ethiopian and is one of the richest Saudis. He has invested heavily in Ethiopia over recent decades through a variety of companies, notably MIDROC Ethiopia Investment Group. Al-Amoudi has a close relationship with the ruling EPRDF government in Addis Ababa and is rumoured to have received favourable treatment in the allocation of privatisation tenders. Since privatization of state-owned enterprises begun in Ethiopia in 1994, companies owned by or affiliated with Al-Amoudi have bought more than half of the dollar value of the sold enterprises.‍ His companies employ more than 100,000 Ethiopians and he has significant leverage with the government and privileged access to land and investment opportunities. Emirati companies that invest in Ethiopia have frequently done so through joint ventures (approximately two-third of investments take this form). 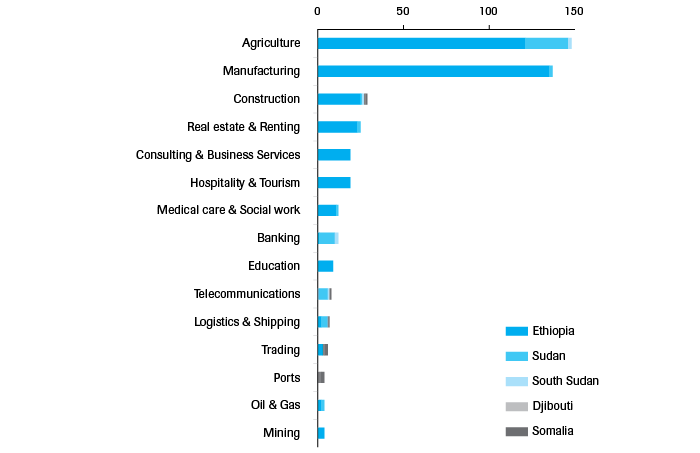 Approximately half of these joint ventures involve Ethiopian companies, while the other halve involves a variety of actors from other countries. investments by UAE companies without partnerships one-third of the time, and investments with partnerships from other countries one-third of the time. UAE companies that invest in Ethiopia often partner with Indian companies, but they have also partnered with a range of other countries, most notably twice with Iran in 2006 and 2013 on bitumen importing and processing. Kuwait’s investments in Ethiopia have almost all been exclusively foreign owned, without any partnerships with companies from other countries. Slightly more than half of Qatar’s investments in Ethiopia have been in partnerships, usually with Ethiopian companies, but they have also had shared investments with Sudanese, Saudi Arabian and Indian companies. The Gulf countries also make use of multilateral and national development funds, which provide official development assistance in the Horn of Africa. The main funds are the Arab Fund for Economic and Social Development (AFESD), the Kuwait Fund for Arab Economic Development (KFAED), the Abu Dhabi Fund for Development (ADFD), the OPEC Fund for International Development (OFID), the Arab Bank for Economic Development in Africa (BADEA), the Saudi Fund for Development (SFD) and the Islamic Development Bank. Data from the ADFD could not be disaggregated and so does not feature in the following analysis. Together these funds (without the ADFD) have begun 309 operations in the Horn of Africa between 2000 and 2017 that are worth a combined total of USD 6.6 billion (figure 18). approximately USD 6.6 billion of investments; oil prices in Brent Crude Oil. Much like Gulf states investment in the Horn of Africa, ODA value was high between 2008 and 2013 that corresponded with a higher oil price. However, when only the number of projects is considered (rather than the value), the trend is slightly different, peaking in 2010 and then declining to 2017. 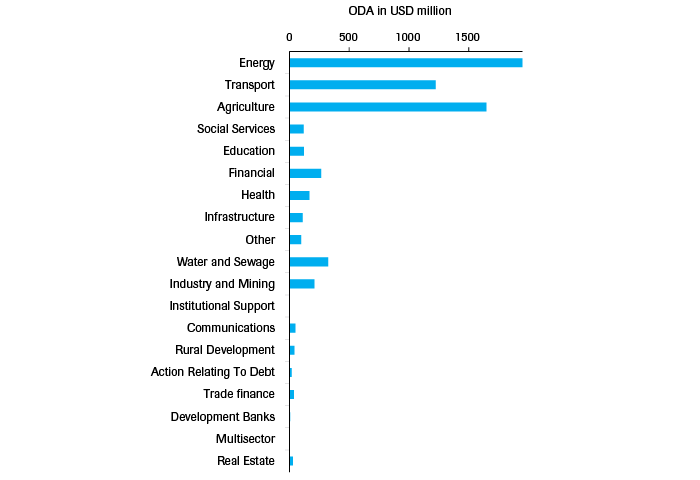 Although the number of investments spiked between 2008 and 2013, the number of ODA projects did not (see figure 19). FDI: 434 investments; ODA: 309 projects; oil prices in Brent Crude Oil. The commercial investments and public ODA differ in two interesting ways (see figure 20). Firstly, the investments are heavily focussed on Ethiopia and Sudan, but the ODA projects also prominently feature Djibouti, which received roughly twice as many projects and ODA value as Ethiopia. This is particularly striking given that Djibouti has a population of less than one million, relative to Ethiopia’s roughly 100 million; its strategic location next to the Bab al-Mandab strait may drive this development. ODA projects in Djibouti showed the same sectoral patterns as ODA projects in the rest of the Horn, although they did also prominently feature port developments and the construction of roads around its ports. Another reason Djibouti received more ODA than Ethiopia is that the Islamic Development Bank, the most active of the development funds, lends only to members of the Organisation of Islamic Cooperation. It therefore has no projects in Ethiopia, Eritrea or South Sudan. Similarly, the Arab Fund for Economic and Social Development has projects only in Djibouti, Somalia and Sudan. Sudan is the most frequent recipient of ODA, followed by Djibouti and then Ethiopia. Unlike commercial investments, Eritrea did receive several ODA projects, with the latest starting in 2014. 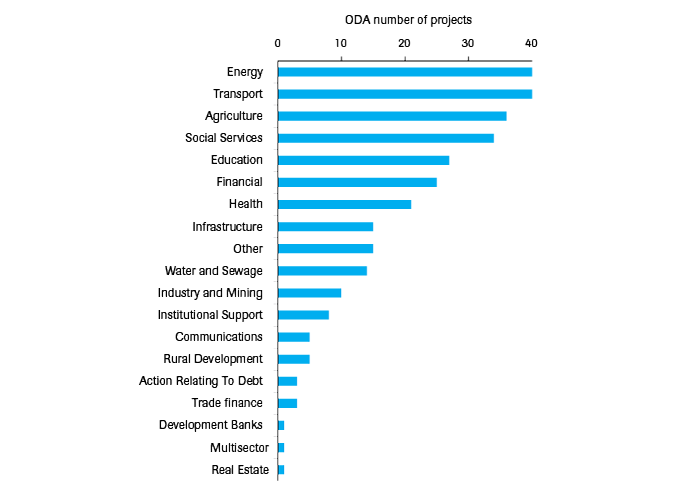 But Eritrea, South Sudan and Somalia hosted relatively few projects and a low value compared to the total ODA. The ODA they did receive was spread over many sectors, with social services and education seeing most of the funding. FDI: 434 investments, approximately USD 13 billion; ODA: 309 projects, approximately USD 6.6 billion. Somalia includes Somaliland. Investment value data could not be found for all investment projects, so the number of investments column includes entries not included in the value of investments column. Secondly, while the investments are heavily focussed on agriculture and manufacturing in both number of projects and amount invested, the ODA projects are heavily focussed on energy and transport as well as agriculture, as shown in figures 21 and 22. Many projects go into social services, education, the financial sector and health. Manufacturing is largely absent. These differences are noteworthy because it may indicate that ODA serves a different purpose than FDI and may also be regulated in a different way. Gulf states have been open in using aid to win political support, as evidenced for example by the role accorded to Kuwait’s significant ODA spending in garnering support at the time of the Iraqi invasion in 1990.‍ This could explain the much higher importance of ODA on areas like education and health compared with FDI. Most of the development funds followed the sectoral pattern outlined in figures 21 and 22. The KFAED, however, had a higher proportion of projects in energy and transport. In addition, the IDB had a lower proportion in energy and transport, and by itself contributed to considerably more than half of the projects in education, finance and health. Of the development banks, the AFESD and the IDB were the most engaged in the Horn of Africa from 2000 to 2017, as shown in figure 23. Both have projects only in Sudan, Djibouti and Somalia, as they are primarily Islamic and have large Arab-speaking populations. The KFAED reaches the most Horn countries: it has projects in every country except Somalia and is the only fund to have projects in South Sudan. Most of its projects are in Sudan and Djibouti. The Arab Bank for Economic Development in Africa has run projects only in Ethiopia and Eritrea. The two projects of the SFD are both in Djibouti in social housing and a port, but Saudi Arabia is the largest donor of the IDB and an important donor to the other multilateral development funds. 309 ODA projects, approximately USD 6.6 billion. In summary, relative to investments, Gulf ODA to the Horn of Africa places a higher importance on Djibouti and a lower one on Ethiopia, and focusses on energy and transportation in addition to agriculture. Within the separate funds are different geographic and sectoral focus areas. The main distinctions are that the IDB and AFESD focus exclusively on Djibouti, Somalia and Sudan, and the IDB provides most of the funding for education, finance and health. Overall, Gulf ODA has a few important differences with FDI, but does not represent a radical departure. Tronvoll, K. 2009.War & The Politics of Identity in Ethiopia. Woodbridge: James Currey. Kerr, S., and Aglionby, J. 2017. ‘DP World wins tribunal case against Djibouti over bribe case’, Financial Times, February 21, link (accessed 22 December 2017). Ethiopia is overrepresented because of the higher data availability, but it would likely still be a major target if the quality of data were equal for all countries. Interviews with Ethiopian businessmen and researchers, Addis Ababa, December 2017. See also: Woertz, E. 2013. Oil for Food. The global food crisis and the Middle East, Oxford: Oxford University Press. The Economist, 2017. ‘The ambitious United Arab Emirates’, 6 April, link (accessed 2 February 2018). Worden, R. 2018. ‘The UAE still supports al-Shabaab through Somalia's illicit charcoal trade,’ Alaraby, 5 March, link (accessed 2 February 2018). Qatar National Bank. ‘Welcome to QNB South Sudan’, link (accessed 2 February 2018). Calvary, R. 2017. ‘Ce que signifie la vague d’arrestations dans les milieux d’affaires saoudiens: Le cas de Mohamed Al-Amoudi’, Orient XXI, 21 November, link (accessed 2 February 18). Wikileaks. 2008. ‘Privatization or monopolization in Ethiopia?’, January 11, link (accessed 02 February 2018). Dahir, A. 2017. ´How the Saudi purge will affect detained billionaires’ assets in Africa´, Quartz Africa, November 23, link (accessed 2 February 2018); interviews in Addis Ababa, December 2017; Borkena. 2017. ‘Ethiopian government “diplomatically” following up Al Amoudi’s case’, November 11, link (accessed 2 February 2018). Interviews with senior Ethiopian banking executives in Addis Ababa, December 2017.